Ellon Probus Club president Norman Davidson welcomed former Aberdeen Lord Provost Margaret Farquhar as guest speaker to talk about “Disappearing Aberdeen”. 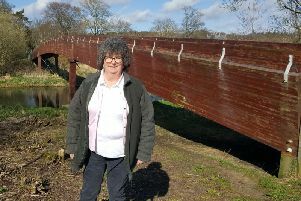 Margaret, born and brought up in Aberdeen, has devoted most of her life to the social well-being of the city and its residents. For her work as long-standing councillor and then as Provost (1996-1999) she received a CBE and was awarded honorary degrees by both Aberdeen and Robert Gordon University. She is still involved with many local bodies and committees including RNLI, Gordon Highlanders Museum and Aberdeen’s Burns Cub. Margaret’s widespread interests made her the ideal speaker to trace the history of Aberdeen from its medieval days with narrow alleys and wooden buildings to its present configuration and architecture. This she did with an abundance of photographs, slides, etchings and anecdotes on places, events and local characters. Following a series of devastating fires Aberdeen Council decreed that all external building walls were to be of brick or stone and roofs to be of slate or tiles. Subsequently local granite was utilised as the main building material. Historically Aberdeen’s prosperity has been derived from its role as a trading port. Tales of the way-laying and kidnapping of young men and their subsequent export as slave labour to plantations in America indicate an unsavoury side to some aspects of ‘trade’. A number of former “slave holding houses” are still present in The Green.